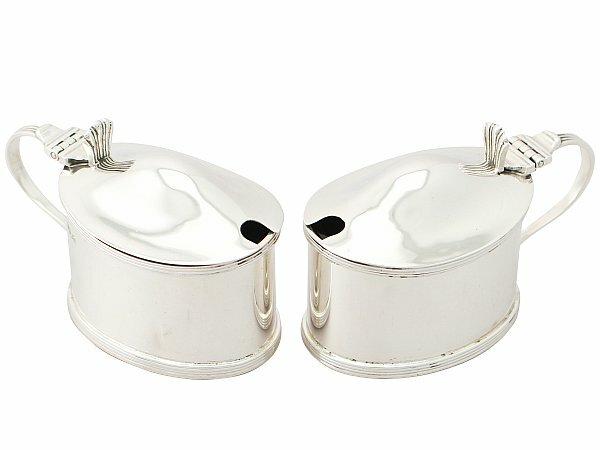 These fine antique George V Scottish sterling silver mustard pots have a plain oval form. The sterling silver body of each mustard pot is plain and unembellished with bands of applied reed decoration to the rims. These fine mustard pots have hallmarked domed hinged covers surmounted with a shell ornamented thumbpiece. Each mustard pot is fitted with a reed decorated C scroll handle. These George V mustard pots can be supplied with an appropriate sterling silver mustard spoons upon request. These antique mustard pots are a very good gauge of silver, fine quality and in excellent condition. Each mustard pot has been professionally polished and in presentation condition. Full hallmarks struck to the surface and part hallmarks struck to the interior cover of each are all very clear. Length foot to handle 8.8cm/3.6"